A month or so ago, I came across this fascinating chart by Fundstrat’s quant, Sam Doctor. What the chart claims to show is this – there is somehow a trailing breakeven price at which Bitcoin has historically traded above. 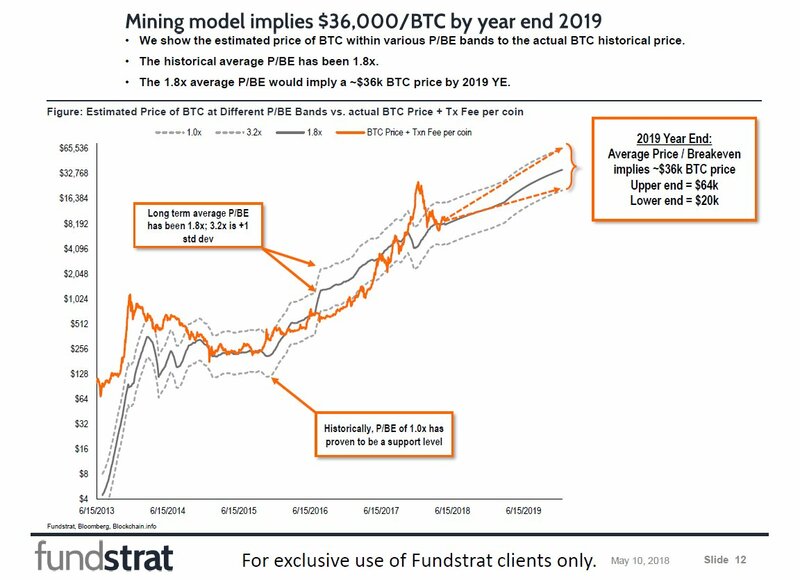 Using a 1.8x average Price/Breakeven (the latest novel effort to fit a relative value multiple to Bitcoin price), he thinks Bitcoin (BTC-USD) should trade at ~$36k by 2019 YE. While P/BE could prove to be an important psychological indicator, I’d strongly caution against anyone using this metric as a fundamental indicator. In fact, unlike commodities, Bitcoin’s average breakeven price likely has no bearing whatsoever on Bitcoin’s fundamental value. 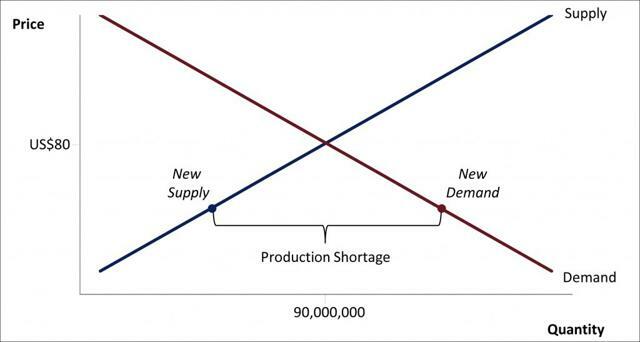 In this context, calculating producers’ breakeven is important as their collective production, combined with demand, results in a shortage/surplus, which in turn influences prices upward/downward. So, really whether the average miner breaks even or not is irrelevant. 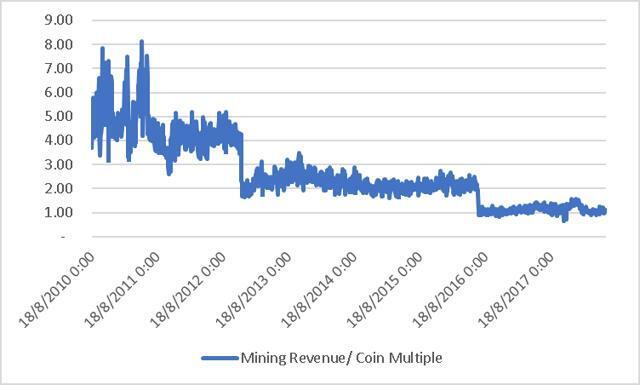 As unprofitable miners exit, the difficulty adjusts in response to ensure the supply conforms to the mathematically pre-determined schedule. Thus, the Bitcoin supply schedule is fixed as long as the lowest cost producer remains in production. 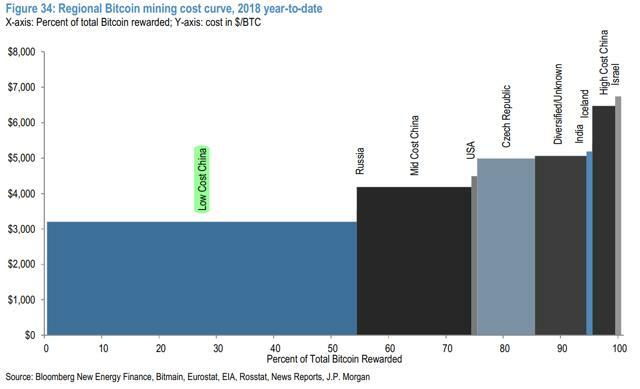 Another interesting theory posited by JPMorgan was that the most important breakeven is that of the lowest cost producer, i.e., a low-cost Chinese miner benefiting from ultra-low energy costs through a PPA. This makes sense considering the concentration of hash power in the Bitcoin network, most of which comes from Chinese mining pools. Using a discounted tariff of ~$0.03/kWh, the lowest cost miner is likely to be located in a low-cost region in China with a breakeven of ~$3,200 per coin. 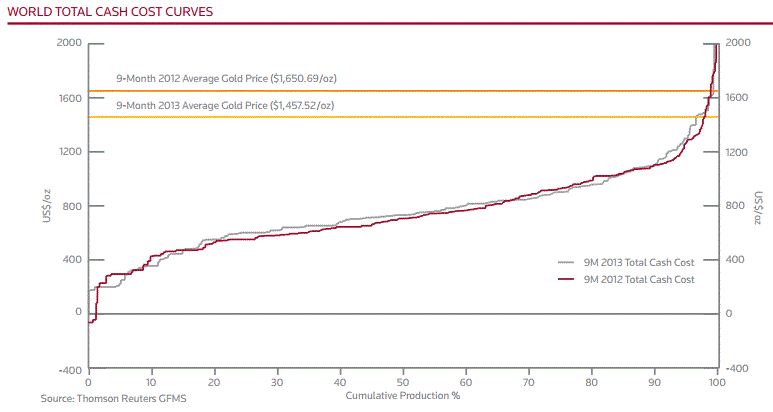 Now, if all other miners were to drop out, the breakeven number falls to ~$1,750. However, should this happen, I’d think the real marginal cost would eventually fall to almost zero as the difficulty adjusts downward to compensate. Now, zero marginal cost is unlikely to happen as there’d also be zero barriers to entry, so a $1,750 breakeven seems fair to me. 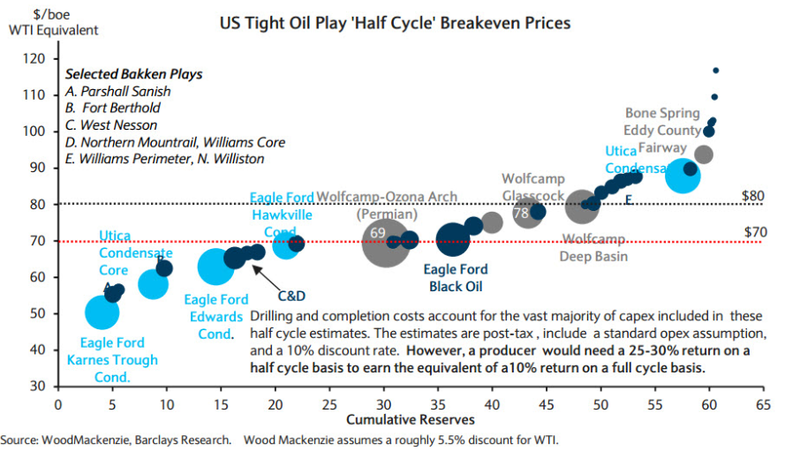 I recall some time two years or so ago when the consensus opinion was that oil would find a floor at ~$50 or so where the shale breakeven point lay. With hindsight, the call turned out to be spot on. Now, I suppose the same logic is being applied to Bitcoin, i.e., below a certain breakeven, miners (producers) will turn unprofitable, leading to lower supply (bitcoin) flooding the market, and restoring equilibrium. Here’s the two key flaws in that logic – 1) Bitcoin’s supply curve, unlike oil, is inelastic and predetermined, and 2) Bitcoin miners are “facilitators” of Bitcoin production, not producers. 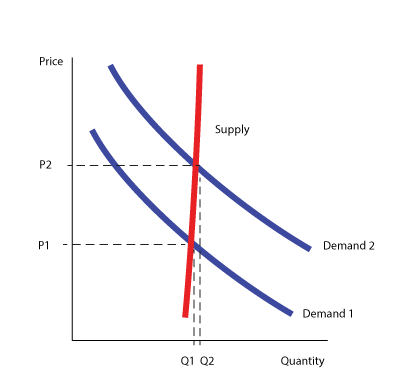 Over the long term, the best parallel I can think of for Bitcoin’s perfectly inelastic supply curve is land. 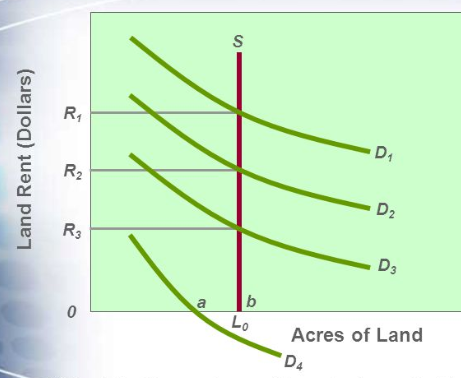 Here’s a depiction of land’s perfectly inelastic supply curve. Like Bitcoin, in the long run, land cannot be “produced”, i.e., there is a fixed supply. 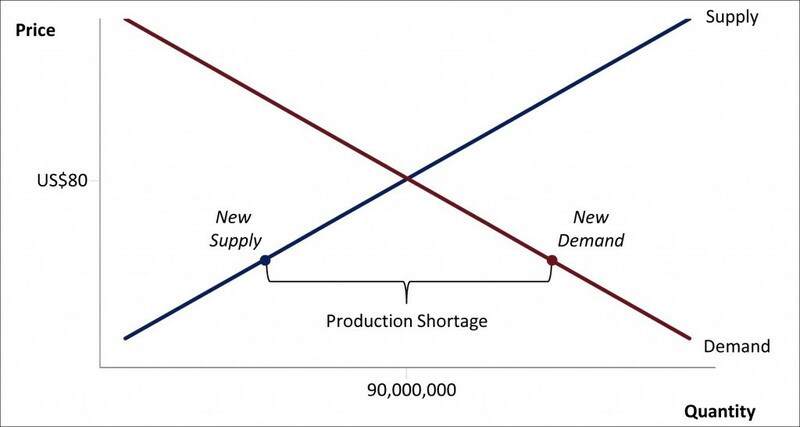 This leaves the long run supply curve perfectly vertical as there can be no further production of land. 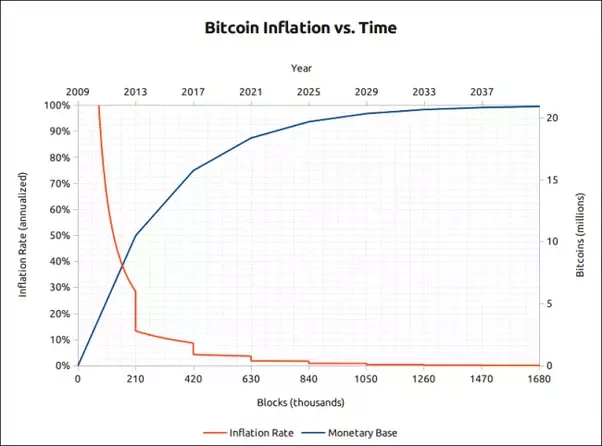 It should be noted that unlike land, Bitcoin’s supply curve should naturally shift leftward in the long run as a portion of supply is inevitably either lost or destroyed over time. This results in a unique deflationary aspect for Bitcoin. Commodities like oil and gold, on the other hand, have elastic supply curves (see gold’s cash cost curve below). 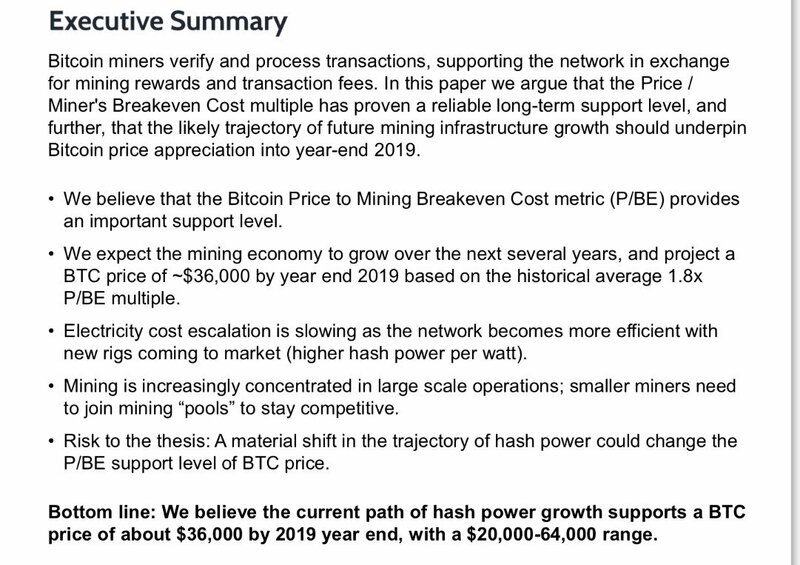 This is important – Bitcoin’s supply schedule cannot be manipulated by “producers” (miners) and thus, a breakeven analysis does not make sense with Bitcoin, in my view. 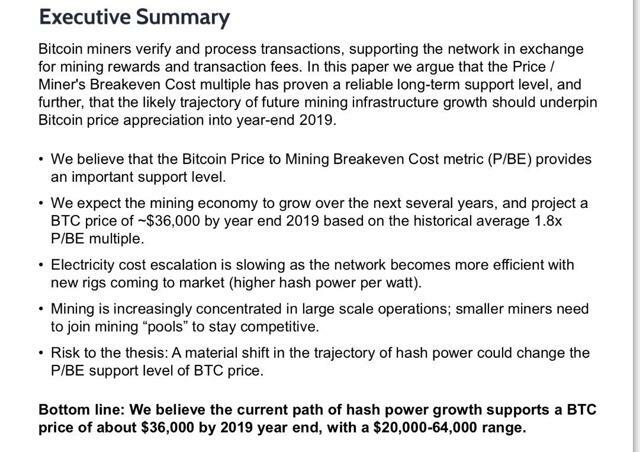 Additionally, due to Bitcoin’s in-built incentive mechanism, there should always be economically rational actors willing to lend hash power to the network and thus, a “lowest cost producer” floor theory is unlikely to hold water. Unlike commodities, Bitcoin miners have no control over the overall supply of bitcoin. Thus far, the supply of bitcoin has followed its predetermined schedule (see below). 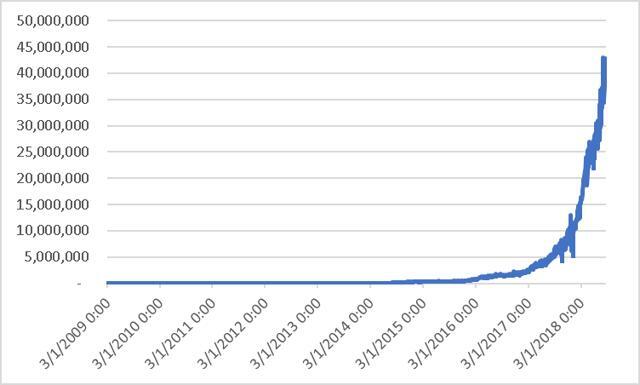 Meanwhile, the amount of hash rate added to the Bitcoin network has risen substantially. While miners cannot control overall supply, they can control their share of the block reward by increasing their share of overall hash rate. 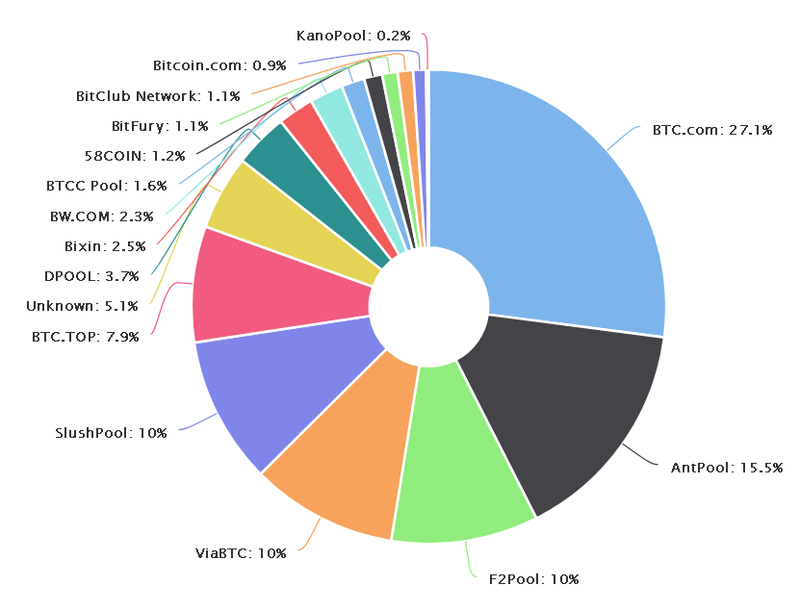 This implies that a mining pool controlling a large proportion of the network hash power can control its share of bitcoin, but overall supply remains the same. Along with the block reward, miners also receive fees for verifying a transaction on the network. The fee portion is determined by supply-demand, i.e., how much a sender is willing to pay vs. how much a miner is willing to be paid. 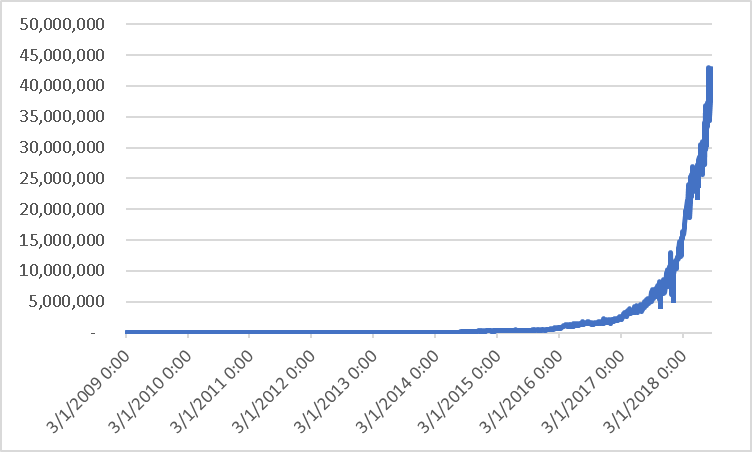 Thus far, we’ve seen little evidence of miners gaining a higher share of the pool by raising transaction fees. In fact, overall mining revenue per coin produced has remained constant, with step changes downward in line with block halving. 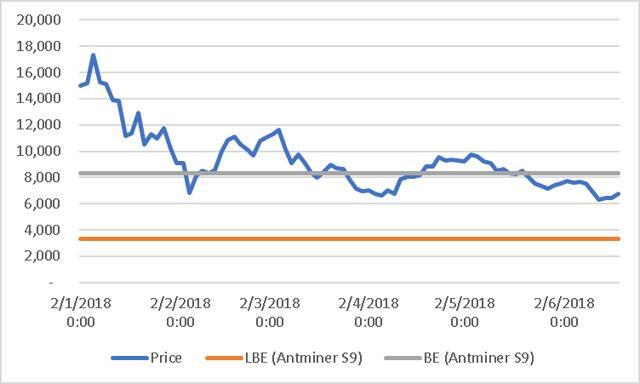 Now, Bitcoin mining is certainly an important consideration with regard to the overall network; however, I believe a breakeven approach may hold little weight for predicting future Bitcoin prices beyond being a purely psychological indicator. In fact, I ran my own analysis on how much it would theoretically cost to produce a coin using an Antminer S9 purchased in January 2018 with typical breakeven (“BE”) and lowest breakeven (“LBE”) assumptions. 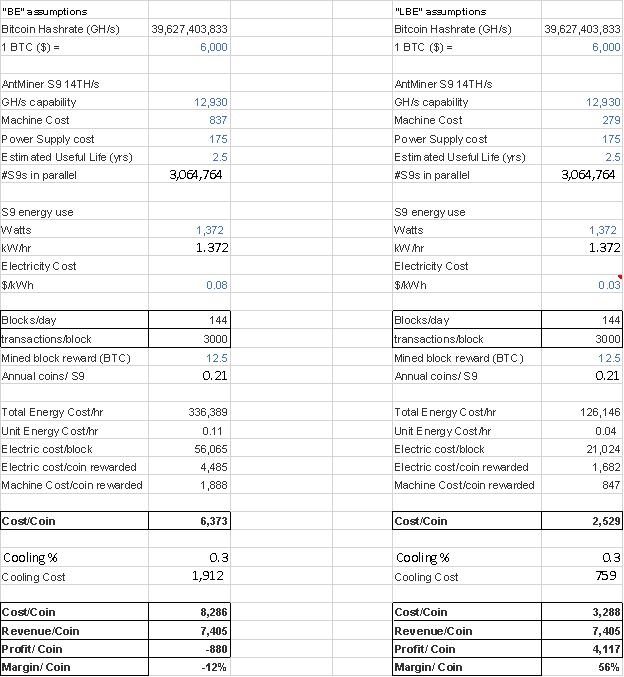 My estimates indicate a breakeven of ~$8.2k for a typical miner and ~$3.3k for a low-cost miner. This certainly has implications for the mining equipment-related names (more on this in a future article), but for Bitcoin’s price path, I’m a little skeptical. Overall, I find two key flaws to a breakeven floor valuation approach – 1) Bitcoin’s supply curve, unlike oil, is inelastic and predetermined, and 2) Bitcoin miners are “facilitators” of Bitcoin production, not producers. Until both these flaws are adequately addressed, I find it hard to buy into the Bitcoin “breakeven floor” narrative. Bitcoin investors – directly or through the trust (OTCQX:GBTC) – should stay focused on demand side drivers. I remain positive on the long-term drivers of Bitcoin (directly or through GBTC). Stay patient and accumulate at these prices.